It's Monday and I'm out sick again. I'll be off to see my hematologist in an hour...sigh. For a Monday like this, the flowering trees here in Maryland never fails to catch my attention; they make me smile every time I see a blooming tree or flower. The photos (by my Samsung Gravity phone) below were taken at the Metro Station - Shady Grove. The Cherry Trees their are in full bloom. 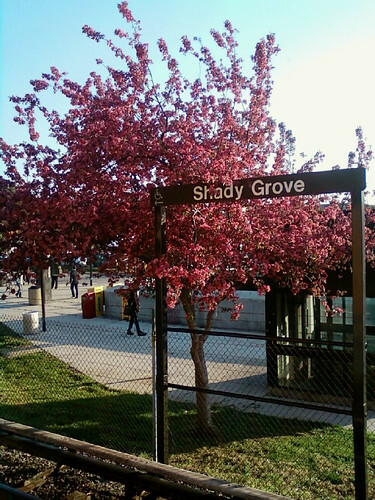 This tree is visible at the Metro platform. I see people usually twist their neck just to look at this tree. 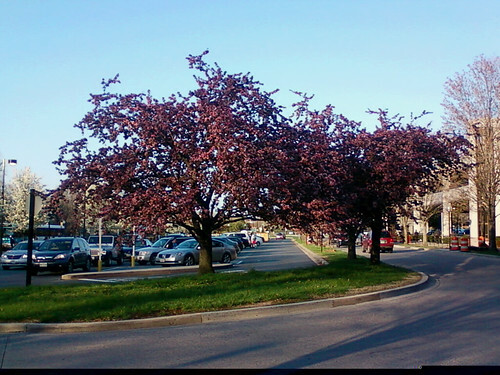 These Cherry Trees adorn the Kiss-and-Ride area. It's called Kiss-and-Ride because this is where passengers get dropped off or picked up, so goodbye and hello kisses are witnessed here a lot. Oh I like the kiss and ride nomenclature. Here we call them simply park and ride, bec well people park their cars here and get a ride either to BART (our train) or to carpool. Kiss and Ride - that's cute. I hope you feel better soon. Those trees are beautiful. Interesting trees you got there!